Giardini Italiani necklace in white gold with 20 round Rubies (12.13 ct), 168 fancy buff top cut Rubies (7.32 ct), 34 round brillant cut diamonds and pavè- set diamonds (28.41 ct). Whether wild, fruitful, desolate or manicured, nature has forever been the ruler of humankind. As such, its power and beauty is one of Bulgari’s greatest inspirations. Working with nature to nurture, grow and sculpt its bounty is an adventure entrusted to master gardeners and landscapers – the artists of the soil. This magical, historic task was the inspiration for Bulgari’s artful Giardini Italiani, recalling the verdant labyrinth pathways, the geometrically trimmed hedges, and the colourful bursts of flowers that only a master gardener can grow. The Giardini Italiani necklace draws its inspiration from the great art of Italian gardens burgeoned during the Rinascimento, when architects, painters and sculptors remodeled the very notion of beauty by exploring a new idea of nature and art. Sculpted with the precious motifs of the enchanting gardens, the necklace celebrates the eternal dialog between art and nature.. It was during the Renaissance period that artists first attempted to work with and shape nature itself, giving it new forms. The undertaking founded what is today a masterful practice, and becoming the renowned Italian gardens we know today. Art and nature are a fateful pairing: the Giardini Italiani collection features the stones and precious raw materials of nature as it moulds them into unique jewellery creations. Resounding with the architectural motifs and delicate flowers that animated the masterworks of the Renaissance, the eternal dialogue between art and nature remains a gorgeous conversation, celebrated as Giardini Italiani jewels. The Giardini Italiani ring draws its inspiration from the great art of Italian gardens burgeoned during the Rinascimento, when architects, painters and sculptors remodeled the very notion of beauty by exploring a new idea of nature and art. Sculpted with the precious motifs of the enchanting gardens, the ring celebrates the eternal dialog between art and nature. 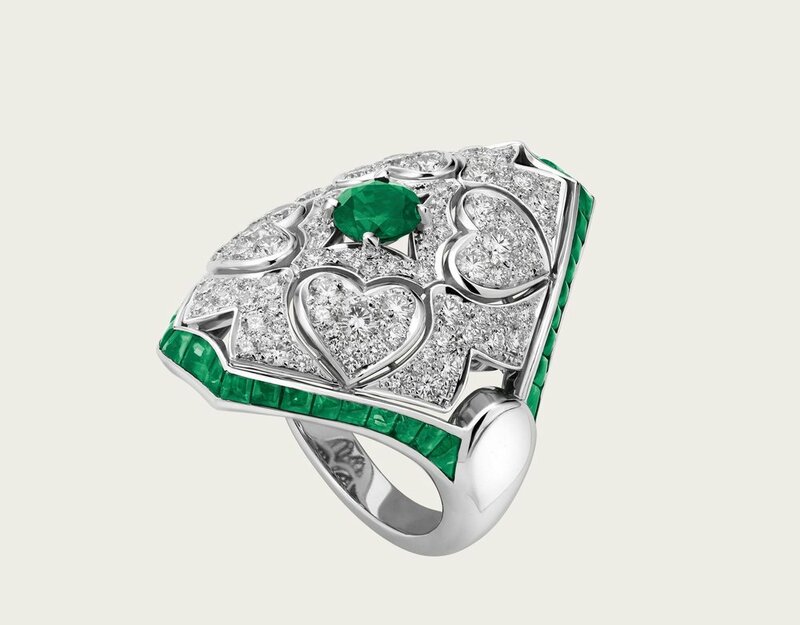 High Jewellery ring in white gold with 1 emerald (0.45 ct), 38 buff top cut emeralds (1.92 ct) and pavè diamonds (1.68 ct).